Catriona (published in the USA as David Balfour) is the sequel to Kidnapped (1886). The novel follows David Balfour’s attempts to secure Alan Breck Stewart and James Stewart’s innocence for the murder of Colin Roy, the “Red Fox”. David is in Edinburgh, seeing to his own and Alan Breck Stewart’s, affairs. While there, he meets the beautiful Catriona Drummond. He had previously met her uncle, Rob Oig, inKidnapped. Her father, James More, is in prison. While in Edinburgh, David visits Mr Charles Stewart, a lawyer. He will arrange for Alan’s safe passage out of Scotland. David now calls on a distant relative, a Balfour lawyer. He convinces him to write him a letter of introduction to Lord Advocate Prestrongrange (the chief legal officer in the Scottish government). Bearing his letter of introduction, David now calls on Prestongrange. He tells him he has come to offer his testimony stating James Stewart’s and Alan’s innocence. Prestongrange, however, is reluctant to accept the testimony: the Campbells demand justice, and if these men were found innocent, the resulting unrest could mean more bloodshed. Prestongrange asks that David call on him again later to discuss the matter further. David now meets Catriona’s father, James More. He is a wheedling, unpleasant, selfish and conniving man, and David instantly dislikes him. He feels ashamed that Catriona should have such an unworthy father. Meanwhile, David spends time with Prestongrange’s three daughters. He particularly befriends the eldest, Barbara Grant. David now meets with Mr Simon Fraser, Umquhile of Lovat, chief of clan Fraser. Now engaged in the Appin case, Fraser tries to dissuade David from giving his testimony by “persuasion, flattery and menaces” (p. 57). When David remains steadfast, Prestongrange tells him they were testing him to see what he was made of. Later, David visits Catriona. He accidentally tells her about his involvement in the Appin murder case, but she promises never to betray him. David’s affection for her grows. David now visits Prestongrange again. He tells David that he will be able to give his evidence at the trial on the 21st of September in Inveraray. Still somewhat suspicious of his and Fraser’s motives, David goes to the park with the Misses Grant. There, Hector Duncansby challenges him to a duel. David accepts but is so inexperienced he is disarmed three times. Duncansby is nevertheless impressed by David’s gentlemanly manner and reveals that Simon Fraser sent him. Duncansby tells Prestongrange what transpired and David expresses his concerns about his welfare. Prestongrange assures him that now he need no longer fear for his life. Charles Stewart now tells David he believes that there is a conspiracy: the government want James Stewart to take the fall for the murder. Furthermore, he thinks that David will be prevented from giving his testimony. He warns David that he may be kidnapped and held until after the trial. It is likely that James More will negotiate release from prison by having his servant Neil capture David. The lawyer advises David to leave Edinburgh, but first David wants to see Catriona and Alan. He tells Catriona about the plot against him, and she asks Neil to give him an hour’s headstart. David then finds Alan. They are pursued, but Alan manages to escape on board the ship David arranged for him. David remains behind and is captured by Neil and his men. He is now kept imprisoned on the Bass Rock, an island off of North Berwick. He will not be released until the 23rd of September, when he will be too late to give his evidence. He manages to convince one of his captors to release him on the 22nd. Learning that the trial is still ongoing, he arrives in the courtroom in Inveraray. David now suggests that he give his testimony in a written statement to the Crown. Prestongrange tells him it will be useless, however, since in the eyes of the court James Stewart is already a dead man. David also learns that James More not only was behind his imprisonment at Bass Rock, but also gave evidence against James Stewart. Meanwhile, David learns Catriona is in prison. She visited her father in disguise and then switched outfits: he left in her disguise while she remained inside. When David learns she has been released he wants to visit her, but doesn’t know where to find her. Barbara gives him advice on courtship and even arranges for David and Catriona to see each other briefly. David now sails to Leyden to study law. Happily, Catriona is also on board and the two spend all of their time together. She intends to disembark at Helvoetsluys, where her father will meet her. When he doesn’t arrive, David decides to help her. Catriona has no money and nowhere to stay, so David takes her to Leyden. The two take up rooms (posing as brother and sister) while David pursues his studies. David and Catriona occasionally quarrel: Catriona is jealous of David’s friendship with Barbara, and the two often misunderstand one another. David’s major concern, however, is for Catriona’s honour and the propriety of their situation. How would it look for the two of them to be living together? James More now arrives. David moves to new quarters so that James can stay with his daughter. Wanting James to think there was nothing improper in his relationship with Catriona, David is distant and cold with her. Not understanding, Catriona is hurt. Meanwhile, David receives letters which he shares with Catriona and her father. The first is a letter from Alan saying he may visit. Another tells David that Ebenezer is dead and the estate now belongs to David. As a result, James More now knows that David is wealthy. James now gives David an ultimatum: either he will marry Catriona, or James will kill him. David insists he will not marry Catriona against her will. He tells Catriona her father is forcing him to propose (which she misinterprets as David’s unwillingness to marry her – David loves her and would marry her under other circumstances), and then explains that his father would marry her against her will. She berates her father and leaves with him. David promises to provide them with a stipend. Alan now visits David. Together, they visit James and Catriona in Dunkirk, France. Alan realizes that Catriona loves David, and tells him he should propose again. David does, and the two agree to marry. Meanwhile, Catriona has now seen her father for what he really is and despises him. When she picks up a letter from an English ship for her father, she gives it to Alan instead. The letter reveals that James has betrayed Alan to the English. Alan confronts James, but spares him for Catriona’s sake. David, Alan and Catriona now travel to Paris where they consult with Catriona’s chieftain. They show him the letter proving James’s treachery, but agree not to make a scandal. James, meanwhile is ill in Paris, and dies after Catriona and David visit. Catriona and David marry and return to Scotland. They have two children, Barbara and Alan. Occasionally, Alan Breck Stewart is able to visit under the guise of Mr Jameson. Quotations from Catriona, The Works of Robert Louis Stevenson, Swanston edn , vol xi (London: Chatto and Windus, 1911). 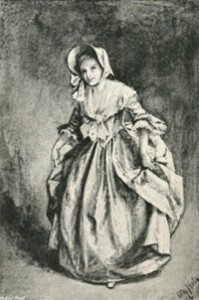 Image from RLS, Catriona (London: Cassell, 1895).